The key to making the perfect portion of lasagna for kids is baking it in a muffin tin. This way you get just the right amount of everything they want. I don’t know about your kids, but in my house, anything that’s individually portioned “just for them” makes it exciting (even when it has spinach in it!). 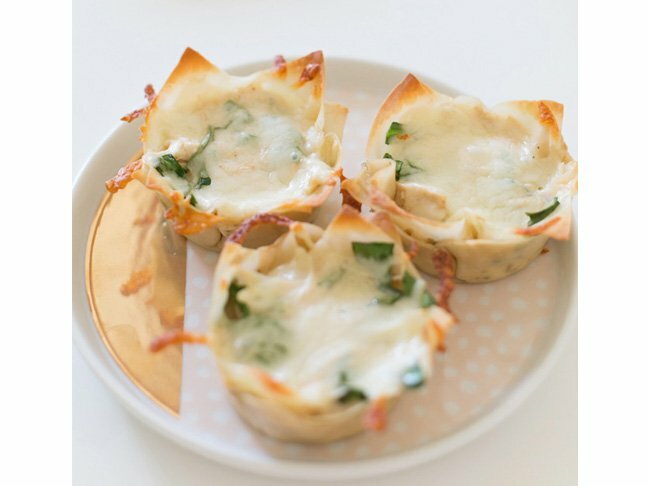 These mini white chicken lasagnas are actually way easier to make than a full pan of lasagna—the wonton wrappers (easily found in the produce section of any large grocery store) don’t have to be precooked, so it’s a matter of layering the ingredients, baking it, and getting it on the table. Anything that's individually portioned makes it exciting for my kids (even when it has spinach in it!). Step 1: Preheat the oven to 350 degrees F. Spray 12 muffin cups with cooking spray. Step 2: In a small bowl, mix the ricotta, salt, pepper, and basil. Set aside. Step 3: In each muffin tin, layer the ingredients as follows: Press one wonton wrapper into the bottom of each muffin cup. Dollop equal amounts of the ricotta mixture into each one. Next, top the ricotta with enough chicken to form one layer across. Then spoon 1 tablespoon chopped spinach over the chicken followed by 1 tablespoon of Alfredo sauce. Press a second wonton wrapper on top of each Alfredo layer and press down firmly. Step 4: Repeat the layering process. Step 5: Sprinkle the top of each cup with 2 teaspoons of shredded mozzarella. Step 6: Bake until the edges of the wontons are lightly browned and crispy and the cheese is bubbly, about 12 to 15 minutes. Step 7: Remove the pan from the oven, and allow to cool for about 5 minutes. Then use a fork to pry the lasagnas out, and serve.